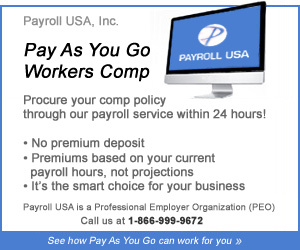 Pay As You Go Insurance with an Employee Leasing Company (PEO) eliminates huge down payment. One of the best features of using and employee leasing company is the pay-as-you-go work comp coverage. There are no up-front costs to get work comp coverage. Traditional work comp policies require a significant up front payment (often 3 months of premium costs) to get a policy in place. Employee leasing companies do not require any upfront payments for workers' compensation coverage. Usually workers' compensation insurance premiums are based on ESTIMATED PAYROLL figures determined prior to the policy period. The outdated "best guess" approach to premium calculation is a thing of the past. With a Pay as You Go policy you only have to pay your premium at the time of payroll. Now your company can eliminate huge down payments and dreaded end of year audits! What If I Get Overwhelmed by Payroll Responsibilities? Professional payroll providers can help when you have issues processing payroll, remitting payroll and withholding taxes to government agencies, and dealing with workers' compensation, health insurance, retirement plans, and garnishments. Call 866-729-4460 or 941-752-3900. We will be happy to assist you.